While clans like the Lion and Phoenix embrace honor and glory, others clans can’t afford such luxuries. The Scorpion put duty above all else, and find honor in serving the Emperor in their own way. The Crab have no need for glory at the Kaiu Wall—there is no room for such distractions in the face of the overwhelming Shadowlands horde. 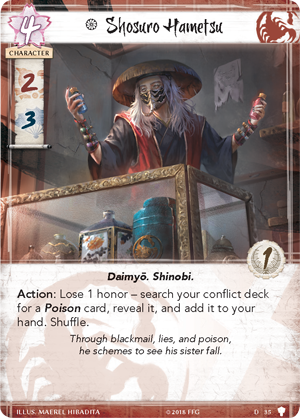 Join us for today’s preview of Children of the Empire as we look to the Scorpion and Crab—two clans who understand the true meaning of their duty to the Emerald Empire. 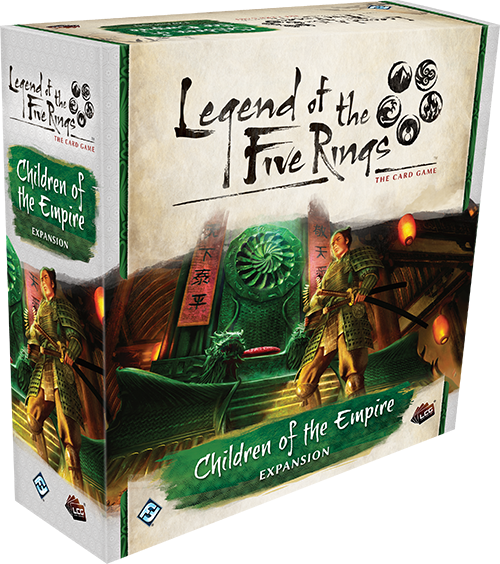 Children of the Empire is Legend of the Five Rings: The Card Game‘s first Premium Expansion, featuring a massive influx of 234 cards (three copies each of 76 cards and one copy each of six cards) spread across all seven Great Clans, making Children of the Empire the perfect next-step for new players and veterans alike. (Children of the Empire, 6) is a Duelist who shines when the Crab have their backs to the wall. While you’re less honorable than an opponent, the Challenger gets an additional military skill… which is sure to come in handy during the military duel the Daring Challenger can initiate, placing additional fate on the victorious character. With careful duels, the Daring Challenger can be a threat throughout the entire game, giving his life for the Crab Clan. (Children of the Empire, 50) to further boost his military skill. Not only is this a massive skill boost, but after you win a military conflict, you may remove one fate from the attached character to force your opponent to discard a participating character! 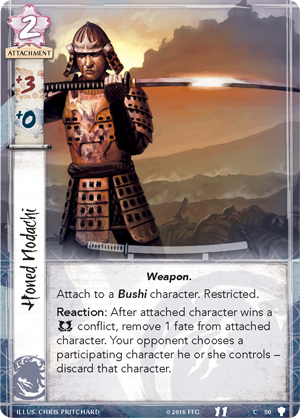 Battlefields are a deadly place, and the Honed Nodachi can guarantee that your opponent will suffer casualties in the conflicts to come. (Core Set, 37). With zero glory, the dishonor will only affect you when the Yasuki Procurer leaves the field—and honor is a small price to pay for more soldiers and weapons at the wall. While the Crab find no need for glory in their work, the Scorpion have carved out their own definition of honor. Though they serve the Emperor with the other six Great Clans, their methods are often seen as unsavory… but their unpredictable nature makes them all the more effective. When the Scorpion need to manipulate the very veins of their foes, there is one Shinobi they know they can count on. 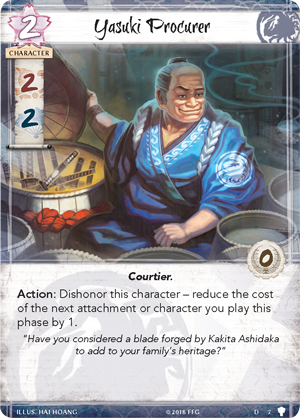 (Underhand of the Emperor, 21) on demand makes Shosuro Hametsu a valuable ally. (Tainted Lands, 38). Each of these are powerful in their own right, but Children of the Empire gives crafty Scorpion an additional Poison option. While the above poisons immediately affect their targets, other toxins take a more subtle approach. (Children of the Empire, 70) is an event that bows one of your opponent’s characters after it triggers an ability, hampering your foes and crippling an essential character across the field. With Shosuro Hametsu on your side, this assurance is never far away. (Children of the Empire, 31) ) is the Scorpion’s politically focused Duelist, and whenever she wins a conflict, you may gain an honor. However, after this character loses a conflict, you lose one honor. 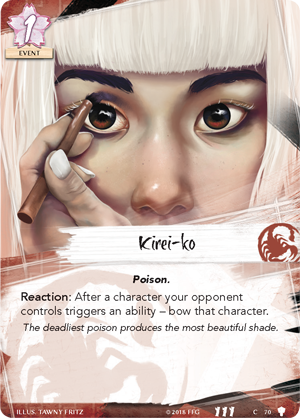 This can make the Loyal Challenger a risky participant in conflicts, but you may also use her to manipulate your exact number of honor, activating some of the Scorpion’s most powerful effects. Loyal Challenger can also initiate a political duel, blanking the loser’s text box until the end of the conflict! Like Kirei-Ko, this can easily be used to neutralize a threat, provided you have the skill to win the duel. Honor and glory mean little in the face of duty to the Emerald Empire. The Scorpion and the Crab learned this lesson long ago, and it is ingrained in every samurai these clans produce. Will you fulfill your duty when Children of the Empire releases in the first quarter of 2019? 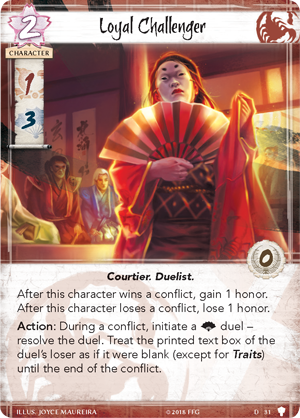 Join us on January 16th as we preview dueling through the lens of the Crane and Dragon, and again on January 23rd for a look at the neutral cards found in the box! 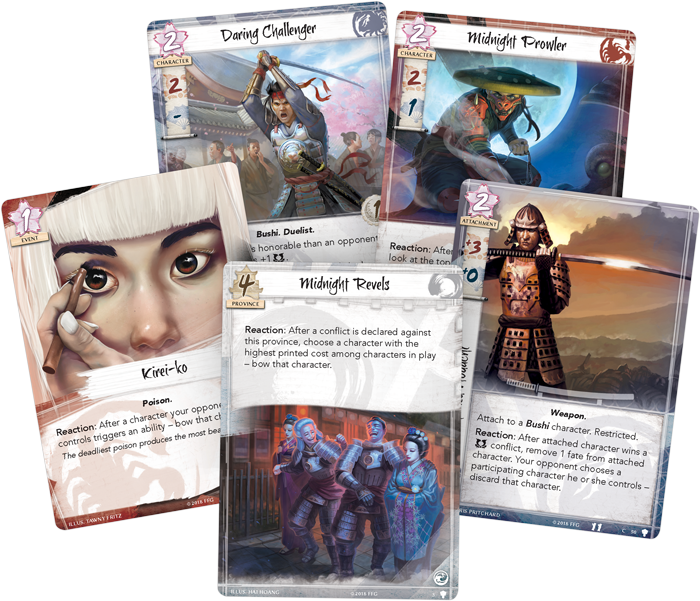 Celebrate Rokugan and pre-order Children of the Empire (L5C16) from your local retailer or our website!